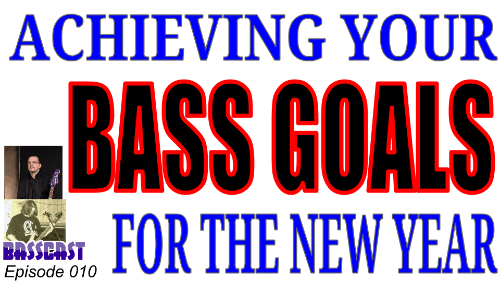 In this episode of the Bass Guitar Rocks Basscast, Mike and Jason tackle the topic of how to set and achieve your bass goals in the coming year. Jason and Mike kick off by catching up, and Mike catches Jason off guard with a mesmerizing display of technology magic (a.k.a he shares his screen inside of Google Hangouts). Jason tells us about his upcoming shows as well as bass clinic he's putting on January 25th. But the main theme of this show is setting and achieving your bass goals. As 2013 draws to a close, most of us will be reflecting on what was great and what could be improved for next year. This is when we set some goals, but if you're not prepared then you could end up like most other people who give up barely two weeks into the month of January! So Jason and Mike provide their best advice on how to set goals, plan your goals and the secrets that you need to use to be able to actually achieve what you set out to do. Would you believe that one of the answers has a lot to do with this weird science experiment that NASA conducted on their astronauts over the course of 30 days? This week features two bass tracks as selected by Jason and Mike. Jason nominates Weather Report's Teen Town featuring Jaco Pastorius on bass guitar. Mike nominates Metallica's Orion from the Master of Puppets disc featuring Cliff Burton on bass (and includes the 'bass only' version of the song for those who are interested in really hearing what's going on with the bass for that song). As always - we'd love to hear your thoughts about this episode, so please leave us a comment below and let us know what questions about bass would you like answered? We'll read your comments on the air, and might even dedicate an entire episode to answering your question - so don't be shy - comment or leave us a question today!